Left: Upper and lower views of cranium OH5 (Paranthropus boisei). Right: Same views of Homo Sapiens cranium. Photo: Image courtesy of University of Granada. Humans represent the only primate whose brain size has increased in tandem with the the decrease in the size of their teeth. 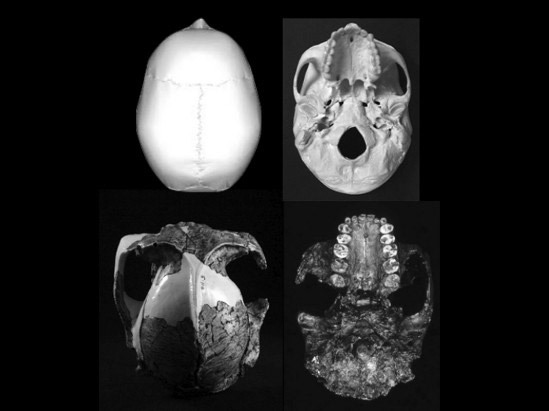 This is what scientists from the University of Granada, Spain, found as they recorded anthropological characteristics of homo samples and comparing them to the ones found in samples of other primates. The researchers consider their find an “evolutionary paradox”. However, they justify the phenomenon through the evident changes in human diet throughout 5 million years of history. It is suggested that Homo’s diet included throughout time, a greater intake in animal proteins, fats and certain oils, elements considered essential for a correct working and maintenance of the brain. As a result, the brain would became stronger and better maintained.Still, the researchers from Granada do not comment on why teeth became smaller or on the relation between brain size increase/teeth size decrease (apart from the numerical analogy). Still, they state that the brain’s increase might be an explanation to why humans became the only primates that managed to engage in achieving technological innovations and develop what we call civilization.